This cover is a work in progress. Hi guys. 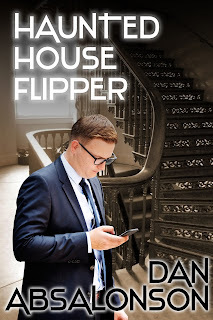 I just wanted to give you all a little update on how my writing is going on my current novel "Haunted House Flipper." Once I started writing every day the first draft was done in a couple of months. Now, however, it's going slower. One reason for this is that I do a lot of the first draft while commuting by talking into my phone. I use speech to text and so my phone transcribes everything I say. It's a really fast way to work and it allows me to talk to my phone while I drive and spit out a story. Of course, there's a lot of editing in post to fix the funny ways my speech gets transcribed into the wrong words, but it's not that bad. My phone is surprisingly accurate and speech to text gets words on the screen way faster than I can type. The dialog also comes out very naturally and seems a lot easier to do than when writing on a keyboard. All this to say that I can't really edit my work in the way I need to while driving. If I was doing copy edits then that's pretty easy. I have my phone use text to speech to read my writing to me and if I hear something wrong I stop and use speech to text in a notes app to write down the typo. Then I can go back later and use the Find feature to search right to those typos and correct them. I'm happy to say that most of the story, even on a sentence by sentence level, isn't changing. The problem is that over halfway through my book I changed the mentor character into also being the love interest. I'm also not sure if they're just going to develop a friendship throughout the book or a romance by the end of it. So those are parts I'm going to need to rewrite or heavily edit. Once I see how that goes I'll get to the end and write the last scene. Then my book will be through the second draft and ready for Beta Readers. If you just can't wait you can also be a beta reader for me now on Wattpad. Just follow along there as I publish the revised chapters until the whole book is up there. I'd really appreciate any feedback you have for me. Thanks! Here's a little preview of the story below if you want to check it out right now without leaving this page. From here it will take you right to the story on Wattpad too!